Uses an Unshielded Twisted Pair cable (UTP); like CAT5; to transmit full motion camera video signal in color up to 1000ft / 300m; and in B/W up to 2000ft / 600m. No power required for video balun. Surge / Lightning Protection. Standard: IEC61000-4-5. ESD : Electrostatic Discharge Protection. Contact Discharge: 6KV / Air Discharge: 8KV. Standard: IEC61000-4-2. Wave / Interference Rejection & Noise. VBU05DC-1UPA is a passive video balun power hub device capable of transmitting 5 channels of baseband video signal and providing 12 VDC power for all 5 channels at the same time using UTP cable. These devices are designed to be used with VBU110RJ-DCPA passive video and power assurance balun. Passive video signal transmission up to 1000ft / 300m and provide the camera with 12 V DC @ 300mA maximum. Built-in Lightning surge protection and interference rejection. Use an Unshielded Twisted Pair cable (UTP) to transmit full motion camera video signal in color up to 1000ft / 300m and in B/W up to 2000ft / 600m. Power Guarantee Convert up to 36VDC to 12VDC on camera site. BNC and DC Male to RJ45 Jack. Passive Video Balun and Power Step Down 12V DC Receiver; Standard 11.4cm Lead. Use an Unshielded Twisted Pair cable (UTP) to transmit video signal and delivering power to camera at the same time. Passive video balun with step down power stabilizer to 12V DC. Low cost with no additional cabling for power; save time on installation and trouble shooting. Transmission distance up to 1000ft / 300m. Support all baseband signal formats including PAL; NTSC and SECAM. Power input range from 15V to 40V DC. Maximum output power 12V DC with 500mA @ 180m / 600ft. Over current trouble indicator LED. RJ45 jack design for easy connection. RJ45 jack 568A and 568B miss wiring prevention design protect device from damage. Built-in Static Electricity and Lightning Surge Protection. 9-CH Network Monitoring and Recording Simultaneously. Gateway Between VIVOTEK Network Cameras and Data Network. Supports VIVOTEK 6000- and 7000-series Network Cameras. Built-in 802.3af Compliant PoE. Local Video Recording with Minimal Bandwidth Impact. Video Proxy Server for Live and Recorded Video. External USB Storage for Video Backup. 1 Year Warranty. 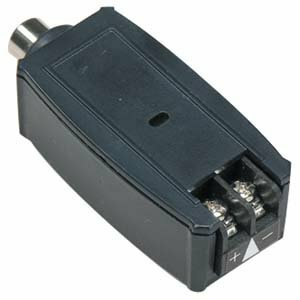 Passive Ultra Mini Video Balun with extra interference rejection BNC male to 2 push pin terminal / Color 1200ft B/W 2000ft; 1 pc. Use an Unshielded Twisted Pair cable (UTP); like CAT5; to transmit full motion camera video signal in BandW up to 2000ft / 600m and in color up to 1200ft / 400m. Surge / Lightning Protection. Standard: IEC61000-4-5. ESD : Electrostatic Discharge Protection. Contact Discharge: 6KV / Air Discharge: 8KV. Standard: IEC61000-4-2. Wave / Interference Rejection and Noise Filter. Passive; no power required. Fast; easy installation; saving time and money. Substantial savings on the cost of the cable itself. Passive Ultra Mini Video Balun with extra interference rejection BNC male to 2 push pin terminal / Color 1200ft B/W 2000ft; 10 pcs/pack. Use an Unshielded Twisted Pair cable (UTP); like CAT5; to transmit full motion camera video signal in BandW up to 2000ft / 600m and in color up to 1200ft / 400m. Surge / Lightning Protection. Standard: IEC61000-4-5. ESD : Electrostatic Discharge Protection. Contact Discharge: 6KV / Air Discharge: 8KV. Standard: IEC61000-4-2. Wave / Interference Rejection and Noise Filter. Passive; no power required. Fast; easy installation; saving time and money. Substantial savings on the cost of the cable itself. Passive Video Balun with extra interference rejection 8 inches Pigtail BNC Male Cable to2 push pin terminal / Color 1200ft B/W 2000ft; 2 pcs kit. Uses an Unshielded Twisted Pair cable (UTP); like CAT5; to transmit full motion camera video signal in BandW up to 2000ft / 600m and in color up to 1200ft / 400m. Built-in Filter: 0~6MHz with Extra Interference Rejection. Passive; no power required. Fast; easy installation; saving time and money. Substantial savings on the cost of the cable itself. Passive Ultra Mini Video Balun with extra interference rejection BNC male to 2 push pin terminal / Color 1200ft B/W 2000ft; 2pcs kit. Use an Unshielded Twisted Pair cable (UTP); like CAT5; to transmit full motion video signal in BandW up to 2000ft / 600m and in color up to 1200ft / 400m. Surge / Lightning Protection. Standard: IEC61000-4-5. ESD : Electrostatic Discharge Protection. Contact Discharge: 6KV / Air Discharge: 8KV. Standard: IEC61000-4-2. Wave / Interference Rejection and Noise Filter. Built-in Filter: 0~6HMz with Extra Interference Rejection 60db. Passive; no power required. Fast; easy installation; saving time and money. Substantial savings on the cost of the cable itself. Passive Video Balun with DC Power connection with extra interference rejection 8 inches Pigtail BNC Male Cable and DC Male/Female to RJ45 Female terminal / Color 1200ft B/W 2000ft; 2 pcs kit . **For Power drop on cable run distances; please see installation manual. Use an Unshielded Twisted Pair cable (UTP) to transmit full motion camera video signal in color up to 1000ft / 300m and in B/W up to 2000ft / 600m. No power required for video balun. Surge / Lightning Protection. 10/700 μs Pulses: 2KV. Standard: IEC61000-4-5. ESD : Electrostatic Discharge Protection. Contact Discharge: 6KV / Air Discharge: 8KV. Standard: IEC61000-4-2. Wave / Interference Rejection and Noise Filter. DC Power Lead: 12V~24V DC. Minimize your cost of wiring for surveillance cameras by using video baluns. Our range of Passive baluns include passive video baluns with DC power connection, 5-CH passive video baluns, passive video/power lead baluns, passive video baluns with power guarantee, passive video baluns with power server, passive video baluns with power server- high series, passive video filter baluns Push-in terminal type, passive video baluns (pigtail BNC Male), passive video balun with power connector kit, passive video balun with video, power, and data, video passive balun/transceivers, BNC passive video transceiver, Passive Video Balun with High Performance Ground Loop Isolator, etc. All our products are available at very competitive prices with uncompromised quality. We only deal in RoHS compliant products which are safe to use and environment friendly.